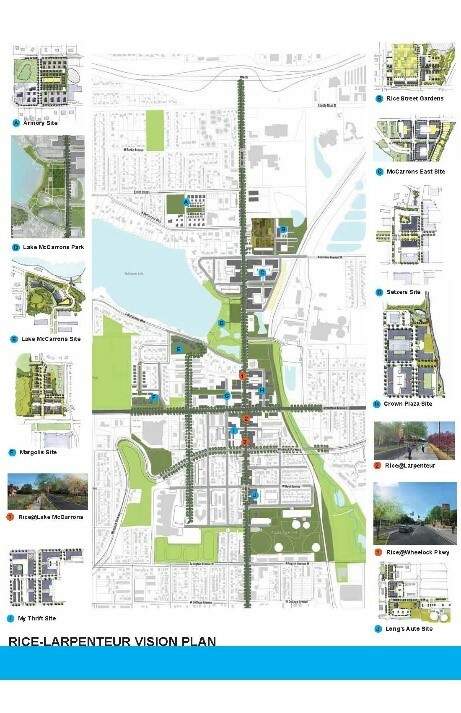 The Rice-Larpenteur Vision Plan (PDF) is a collaborative effort of the cities of Maplewood, Roseville and Saint Paul, and Ramsey County. The Vision Plan includes a strategy to manage future growth of the Rice-Larpenteur Gateway Area in a manner that improves connectivity and accessibility within the corridor, and creates an attractive destination with strong businesses, vibrant neighborhoods and beautiful places. A Gateway Area Planning Committee comprised of staff and elected officials from the cities of Maplewood, Roseville and Saint Paul, and staff from Ramsey County, along with a Citizens Advisory Group comprised of residents, property/business owners and community advocates met regularly over an 11-month period in 2017/2018. Together, they created the Rice-Larpenteur Vision Plan, which was approved by each of the cities and endorsed by Ramsey County in 2018. In March 2019, the Gateway Area Planning Committee hired the Saint Paul Area Chamber of Commerce to staff the new Rice-Larpenteur Gateway Alliance and manage implementation of the Rice-Larpenteur Vision Plan. Next steps include convening and staffing the Interim Alliance, building and supporting a Long-Term Alliance, actively seeking economic development opportunities, leading the development of a multi-year funding strategy, and supporting vibrant community events and placemaking initiatives. The Rice-Larpenteur Gateway Area will be a safe, engaging and inviting neighborhood center that includes common spaces, a high-quality pedestrian environment and robust reinvestment for the diverse people of the surrounding communities to live, conduct business, and play together. Ramsey County and the collaborating cities set up a Gateway Area Planning Committee made up of elected officials and staff members from the three cities and the county. A group of stakeholders from each city made up of residents, businesses, planning commissioners, members of neighborhoods and business organizations met to provide community input to help shape the development of the plan for the project area. In 2017 the Rice-Larpenteur Gateway Area Corridor was selected by the Urban Land Institute (ULI) for funding as part of the building healthy street initiative due to its heavy focus on safety, health and social equity. View a video from ULI about Healthy Corridors. Rice-McCarrons Neighborhood Clean-Up & Meet-Up! Saturday, April 27, 9:30 - 11:30 a.m. Bags, gloves, cookies and coffee provided. Coordinated by the Rice-Larpenteur Gateway Alliance. Questions? Contact Kim at 651-265-2795.